August 2018 - All Transportation Shopping Clients Will Receive New Shopping Bags! The Peabody TRIAD Council meets once a month and works diligently to present their programs to all Peabody seniors and to develop & implement programs which enrich and protect the day-to-day living of all the seniors in our community. 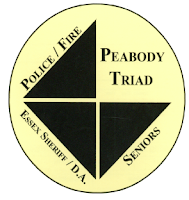 These programs are currently being presented at various venues, including Senior Housing.TRIAD events have been held at the following sites for information and distribution of TRIAD materials. The Do's and Don'ts of Recycling!